Mohinder Singh Sukheja was the husband of my Dad’s second cousin. Over the years and living in England he became a dear uncle to me. He sadly passed away at the end of 2017. This is a tribute to my Uncle and the fond memories I had of him. Mohinder Singh Sukheja was officially born on 1 January 1932 in Kamalia that is now a part of the Punjab part of Pakistan. He was the second child of a family of seven with 4 sisters and 1 younger brother. At the age of 15 with the horrors of Partition he had to flee with his family to India. Along the way he became separated from his family and lost. I remember him telling me how in the intense heat, with all the walking he had to do, he became very tired and dehydrated. He literally thought he was going to die. He told me how he desperately prayed to God to rescue him. He was later on picked up by an army truck and reunited with his family. He never forgot how God had been merciful to him. He settled in Kapurthala in Punjab. He graduated with an MA in History from Chandigarh University. He did teacher training and eventually progressed to becoming a deputy head. In July 1964 he married Daleep. He was encouraged by a colleague to apply to teach in England and so arrived on his own in September 1965. By the second day of arriving he was working in a factory in Shepherds Bush. His landlord did not allow him to cook so for a number of days he laughingly told me he lived on a diet of just bananas! He then spent 5 years working in a post office. His wife Daleep joined him in March 1966. They had two daughters Baljit Daisy and Prabhjot Lily. By 1968 they had bought and settled in their home in Southall. Uncle kept his strong desire to teach. So eventually he started a teacher training course in Coventry for 9 months, staying up there for the week and coming home at weekends. He spent 6 years at Thomas Buxton Junior School in Tower Hamlets, East London before coming to North Primary School in Southall where he was a multilingual teacher until he retired in 1997. What are my memories of Uncle Sukheja?…..
For Uncle Sukheja God was not some philosophical idea. Over the years we had many conversations. There were certainly many things we did not agree on, but one thing we did agree on was that God at His core and essence is love. And from that love comes a mercy and grace we do not deserve. Uncle understood that not just intellectually, but in his actions and the way he treated others. He was keen to show love, mercy and grace to others even if they did not deserve it. Perhaps that was because of the mercy he knew he received in being rescued during the Partition. He also loved to talk and sing of the ‘Satnam‘ (true name) and ‘Wahi Guru‘ – the wonderful counsellor who we can cast all our anxiety and concerns upon. Every year he was keen to acknowledge and celebrate Jesus’ birth, death and resurrection at Christmas and Easter. When I think of Uncle’s life I am struck how he reflected the character of God to others in his actions.He had a genuine warmth and affection for others. He loved to live with joy and had an infectious laugh.He loved to write poems and heartfelt Christmas and birthday messages. He had a genuine desire to look for the good in others. He made his wife and children a high priority in his life. We are going to miss you Uncle but thank God for your life and the example of positive joy and enthusiasm you gave us. 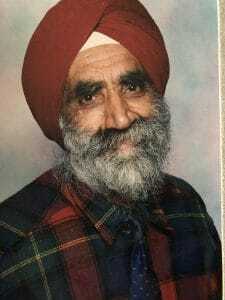 Uncle Mohinder Singh Sukheja we entrust you to the God of love, grace and mercy you and I so often talked about. PrevPreviousWhat am I learning about you?